Issue number 257 of the CIES Football Observatory Weekly Post presents the players with the highest estimated transfer value per big-5 league club. The potentially most expensive player overall, Kylian Mbappé (€228 million), represents 25.9% of the total squad value of Paris St-Germain. A similar percentage was measured for Jadon Sancho(€148 million, 24.9%) at Borussia Dortmund. Despite his age, Lionel Messi remains the most valuable FC Barcelona’s player: €171 million. The Argentinean is the oldest footballer among those with the highest transfer value out of all big-5 league clubs. At Juventus, 34-year-old Cristiano Ronaldo (€125 million) is only outranked by Paulo Dybala (€142 million). Paris Saint-Germain midfielder Adrien Rabiot has reached an agreement to join Real Madrid this summer, according to reports in France. The 24-year-old’s contract with the French champions is due to expire at the end of the season and he will leave the club on a free transfer. Liverpool, Barcelona and Tottenham have all been linked with a move for Rabiot. But according to Canal+, Rabiot has opted to join Madrid and is on the verge of signing a provisional agreement with Zinedine Zidane’s side. Rabiot has not played for PSG since December following a bust-up with the club’s hierarchy during contract negotiations. The French midfielder has subsequently been frozen out of the first team and was even banned from the club’s training ground. Rabiot also angered PSG fans after he was spotted in a nightclub just hours after the club’s defeat to Manchester United which resulted in their elimination from the Champions League. ‘Adrien is a prisoner. He is a hostage at PSG,’ Veronique Rabiot, the midfielder’s mother and agent, told L’Equipe last month. 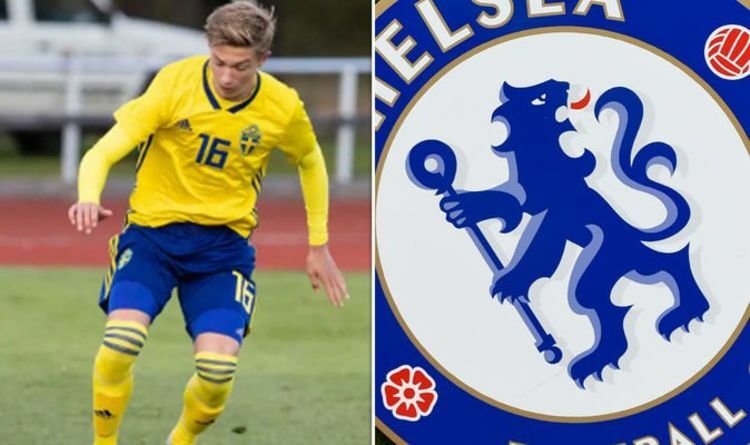 Chelsea have reportedly agreed a deal to sign Swedish teenager Edwin Andersson when he turns 16, according to his father, Mikael, the Daily Express report. Andersson currently plays for Swedish side IFK Gothenburg and has attracted interest from some of Europe’s biggest clubs over the past six months. The reported move appears to be extremely ironic, as the Blues have been handed a two-window transfer ban after their recruitment of foreign minors, however, Chelsea have since appealed the ban, with a verdict expected from FIFA on Thursday. And talking to Swedish outlet Expressen, Mikael revealed there has been plenty of interest over his son and admitted he has chosen to head to London when he turns 16. There have been an incredible number of clubs from virtually all countries that have been interested in him. But he has chosen to go to Chelsea when it’s time. According to the rules he must be 16 first and then it is up to the clubs to agree. There’s still some details, but the day it’s time he has decided that it’ll be Chelsea. Mikael then went on to reveal his son’s style of play, and despite many seeing the similarities between the Swede and Juventus star Cristiano Ronaldo, Andersson Sr compared his son to current Chelsea starlet Callum Hudson-Odoi. What would be your ideal transfer window (in case the ban is frozen). Mine would be one where we mainly sell the dead wood (be it the first teamers or the loanees) and finally get a few young players in. I mean why the hell do we Eduardo on loan? Seriously need to reducing the sheer columes on our books. That's a total of 394mil £ worth of exits. Most of them are not good enough to play (loanees), others don't fit the system (zouma, complete exception. I would love him back but not a fit for our current manager), some want to taste new things (hazard), others are deadwood (DD, Pedro, Alonso etc). Striker - Werner? Jovic? Does not matter the money, we should try and get a good young striker out there. Not a hilarious over the hill higuain and neither someone who has never led a team like morata. Both of jovic and werner look really great prospects and should be good buys. Wingers - we already bought pulisic. But will need 2 more wingers. I am really tied of watching Pedro and willian do what they do. Pedro is just bang average while willian has some serious short comings. Both are 30 ish and not really going to improve or give us anything that we don't already know. I know, losing 3 out of the current 4 wingers would be a massive thing, but the club needs a Revamp. The core has grown soft, and needs to be changed. - 100mil. One of them can be thorgan hazard. He has really grown. Reece James - replace Zappa with James. No need for wan bisaaka as good as he is. It's the perfect time to get the young guy in. Tomori - to fill in the 4th cb spot. Da silva - I really like this guy and feel he is underrated. Height is an issue but the guy is a good footballer. Ake - 40mil. I think he is class. Should be bought back. A young squad, yes. But we need a serious change in the way we do things. So basically you are saying even if we can buy players you don't want new defenders and midfielders? Depends on your definition of "new". Out of 8, I want 3 "new" defenders - ake, Reece, Jay. In midfield, I think we have good options. RLC is showing his quality. Ampadu deserves a chance in the least. Are there any good left back talents out there? We should pick Chilwell. I dont even mind if we overpay for him. He is quick, good on both ends, quite intelligent and also english, used to PL tempo. If not him, then Mendy or Firpo. For RB, I hope we go with Azpi and James next season. De Ligt looks to have agreed a deal with Barca it seems. That's two future world beaters in De Ligt and De Jong. The latter going for 75 million. Proven talent. Then there's us. Spending 65 million on a Dortmund bench player with no end product and a history of muscular injuries. Never change Chelsea board. Never change. Midfielder because I hope Kovacic goes back to Madrid and we need someone new. Ndombele would be my pick. LB. Emerson is doing fine IMO, so just maybe I would give him another season to prove himself. He was fantastic in serie a with regular playtime, so maybe he can regain his form. If not then Chilwell. Keep James and Zouma as Zappa and Cahill replacements. Mount, Tomori and Abraham hopefuly get loaned in PL or french/german/spanish first league. Idealy I would also love to see Pepe here, because he would realy release some pressure from our striker, but board already wasted this chance with Pulisic purchase and I dont see us going for another winger, unless we sell Hazard. Willian, Pedro, Kovacic, Higuain, Zappacosta, Cahill can leave. I expect very nice amount of cash from Bakayoko, Morata, Batshuayi sales, so we can definately fund 3 top players. Leroy Sane is reportedly unhappy at city. And with Sterling heavily favoured over him, he might decide to put in a transfer request. If we could pull off a reverse De Bruyne and develop him into a star (in case Eden leaves). 15 goals and 18 assists this season, wouldn't mind it at all.